Strictly speaking, from a Buddhist philosophical point of view, the conception that “I” am Dorji Wangchuk or that Bhutan is “my” country would be a misconception or misconstruction. This is because although the historical Buddha himself seems to have been rather noncommittal about the existence or nonexistence of a substantial Self owing to risks involved in committing one-sidedly to one of the positions, the majority of Buddhist traditions have come to accept that there is no such entity or reality as a (substantial) “Person” or “Self,” and thus any identification of “I” or “mine” has no epistemic or intrinsic value whatsoever. Yet the conceptions of “I” and “mine” seem to have been employed by individuals with enormous instrumental value. In the history of Buddhist philosophy, the conceptions of “I” and “mine” also came to be modified to assume positive roles such as combating elements of egoism and selfishness that are an impediment or a detriment to one’s spiritual aspirations. From a worldly and an existential point of view, “I” and “mine” would be the centre of one’s universe; a spatial and temporal point of reference for everyone else and everything else. Even Buddhist philosophers would perhaps concede that an “identity crisis” (or “identity loss”) would be an impediment and detriment to one’s worldly and spiritual aspirations. I consider myself fortunate that my education at home and abroad and my experiences (on both personal and professional levels) up to now, have helped me to positively or constructively shape, reshape, and accept my (real and ideal) identity as a person and as a Bhutanese. Although my actual or real identity as a person and as a Bhutanese is far from my ideal identity as either of the two, I have attempted to harmonise between who I am, on the one hand, and my place and role in my relationship with the world, on the other. Although my identification as a person is innate, and my national identity a trait acquired in the course of time, they seem to me to have eventually intermingled. Being someone who has still not eliminated the conceptions of “I” and “mine,” and thus still has not overcome various kinds of worldly concerns, hearing or reading flattering things about my homeland such as about its pristine nature and culture naturally makes me feel good, regardless of how much of it is true. On the other hand, hearing or reading negative things about Bhutan such as being a perpetrator of human rights abuse and even of ethnic cleansing is painful, irrespective of the merit of the allegations. However, going beyond these instinctive reactions, my concern is not so much about the positive or negative perceptions of Bhutan but rather about its grotesque black-and-white representation, be it positive or negative, by the Bhutanese or non-Bhutanese, at home or abroad. The cumulative effects of my education and experiences have influenced my perception of my identity as a Bhutanese in at least three ways, namely, in cognitive, emotive, and conative terms. Firstly, in cognitive terms, having learnt to recognise that real appreciation or depreciation of anything knowable must be based on a nuanced understanding of it, that is, regardless of one’s personal likes and dislikes, I have come to neither glorify nor vilify Bhutan but to see it as it is, and not anything more or less. I have no desire to uphold and live a fantasised image of Bhutan, regardless of who created it. Similarly, I have learnt to recognise virtues as virtues, and vices as vices, wherever they might be. 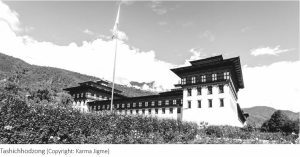 Secondly in emotive terms, being influenced by the Buddhist values, I have aspired to find a mature way of dealing emotionally with any type and degree of praise or criticism regarding Bhutan. In addition, I have developed a certain degree of sensitivity to any form of discrimination and racism, be it in my homeland or abroad. Third, in conative terms, I feel that my experience has enabled me to accept not only my personal and national identity but also my cultural, ethnic, and religious identity, with a certain sense of maturity, responsibility, and serenity. While I may not qualify as a Bhutanese patriot, I have certainly remained emotionally attached to Bhutan, not because it is in any way perfect or superior to other countries but for what it is for me, namely, a home, a place where I was born and bred; a country where my roots lie; whose languages I speak; whose cuisine I relish and cannot relinquish; whose pristine nature is worth protecting; whose culture I believe is worth preserving; and whose sovereignty is forever worth guaranteeing. About Author: Dorji Wangchuk (PhD) is a professor for Tibetan (Buddhist) Studies at Universität Hamburg, Germany. His main teaching and research interests lie in Tibetan Buddhist philosophy, Tibetan intellectual history and history of ideas, and Tibetan Buddhist intellectual/ literary/textual culture.